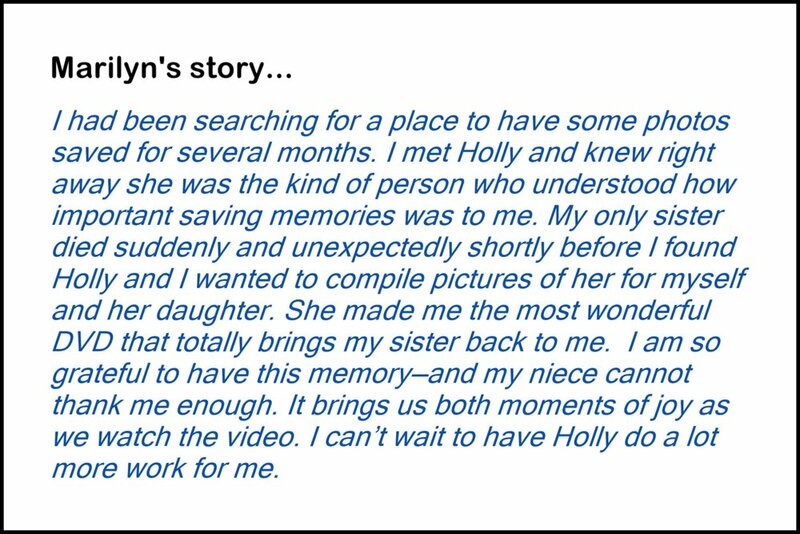 We help families and small businesses celebrate life, tell stories and touch hearts with their photo and video collections by helping them to organize, preserve and share a lifetime of memories. We believe that photos and memories build relationships and we can’t wait to help you share and preserve yours. The services we offer are designed to bring you peace of mind and bring your photos and memories back into the light. Do you have a group that wants to learn more about preserving memories and organizing photos? We love to share what we know! Contact us for more information. Voices in the Valley, a radio show on KLBB 1220 AM, features local people and their stories. 11-25-2016 Broadcast - Holly talks about why and how to share family photos, videos and memories during the holidays. Her interview starts at 20:15. 6-19-2016 Broadcast - Holly shares tips on organizing your photos to tell your story.